The highlight of my weekend literally involved highlights…And a three-inch haircut too! I always check out my hair in the salon restroom before paying. I like to shake it out, readjust the pieces and make sure the length, cut and color is correct before I leave. The only thing that could have been better than a great hair day would have been if we scored a Hershey’s Take 5 bar in all of our Halloween candy. Do you know the Take 5 bar? It’s a mix of pretzels, caramel, peanut butter and peanuts covered in chocolate. I did have some Dots though. Rarely do I choose the chewy stuff over the chocolate stuff but for some reason that’s what was calling my name from the candy pile this year. And the Milk Duds. 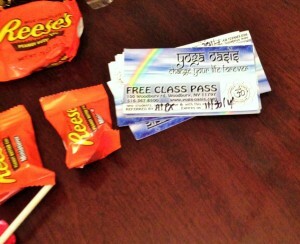 We didn’t get any pennies this time but we did receive free passes to a local Yoga studio. 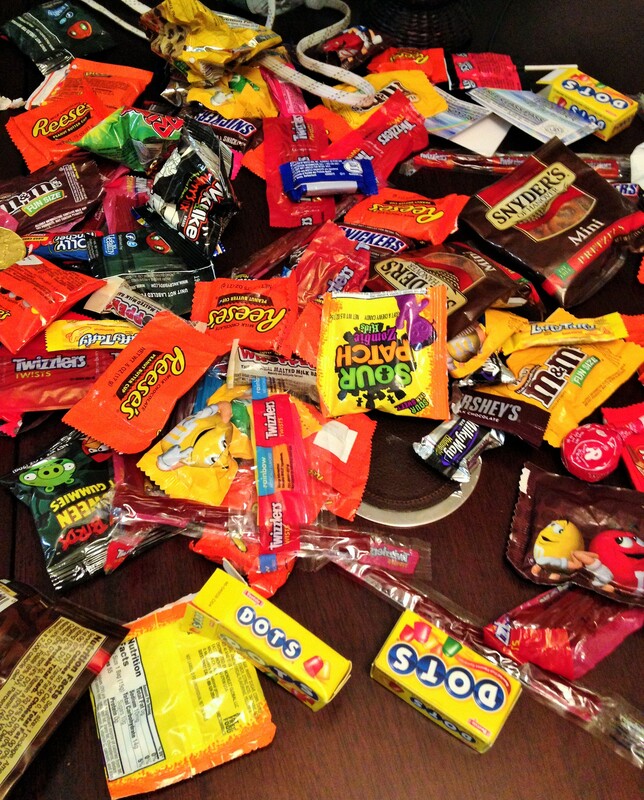 I am ready to move on from Halloween but it looks like the amount of candy my son brought home will be with us for a while. So now that it’s November and the weather is taking a turn for the colder (and wetter and windier as per this past weekend), I’m slowly digesting the possibility of another miserably freezing snow-covered winter. While I ran a whole bunch outdoors through ice and snow and frigid temperatures last year, there were plenty of days where I was cooped up inside the gym due to mounds of snow covering my path. I am totally grateful to have a gym within a few steps from my front door but geez, a girl can get bored with the same old cardio machines day after cold day. So as I write this I wonder how it is I get bored inside a gym which offers many more options than simply running outside. But running outside isn’t just running outside if you know what I mean and I think you do know what I mean and this tangent I am on really deserves a post of its own some other day. Last week I completed a terrific made-by-me elliptical workout that was anything but boring. I was engaged, focused and sweating without impacting my joints and the time flew by in a flash. I liked the routine so much that I decided to make you a pinnable image of the workout so you can follow along with the burning elliptical routine too. I am sure that we all have different elliptical machines but I do believe they all have a random setting which will put you on a course of varying inclines. That’s what those orange dot patterns mean below. Select that random course or something hilly just so you won’t be on a flat course and won’t have to deal with changing your incline on your own because you will be too busy changing the resistance level instead. I like the high resistance levels. 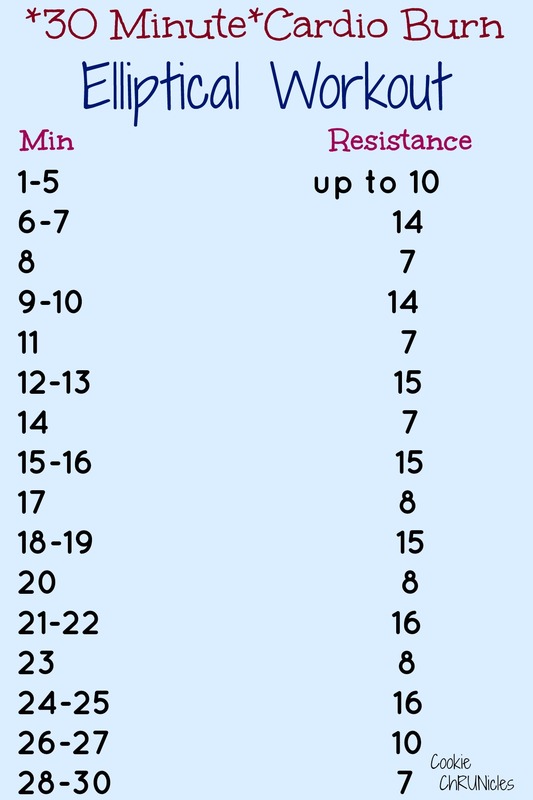 They take time to get good at but I really feel that working out on the high resistance levels when combined with the higher inclines on the elliptical has helped me to build up my endurance for hill running even though I don’t run hills often. Obviously adjust my suggestions below accordingly to your abilities. Use this as a guide to motivate yourself but not to push yourself so beyond what you are used to that you risk injury or falling off of the machine. Feel free to switch pedaling directions as you wish. I usually alternate between forward and backward every few minutes but I don’t hold myself to a strict routine on that part. I do not pay attention to miles. You are cross training today so your miles don’t matter. You are pedaling on some machine and your focus is to handle the steep climbs and not lose your balance when you pedal backwards. Let me know if you try it out or if you have any questions! If you are interested in more workouts, check out my Running section at the top of this page. If you had Halloween candy over the weekend, which was your favorite? Do you like the elliptical? How often do you use it? What’s your workout plan for today? The elliptical is one cardio machine I used to love… before running! These days though it’s usually put to the side. I honestly can’t even recall the last time I worked out on one. Maybe once the twins are born I’ll give it a try again :). I can’t say I love it but I do love the option of having it on days where I don’t run. IF i had candy over the weekend, IF!!! I definitely had way more than my fair share, but I felt like it was justified, and as I do not yet have a race on my calendar….its okay right? 🙂 Funny, I went to Kroger on Saturday, and there was SOOOOOO much left for 70% off, my mum and I went nuts, but I was looking for Take 5, but there were not any, boooo! They must be a hot commodity! It’s totally okay…I am all about eating what you enjoy to balance out the diet. What’s the point in living if you can’t have some chocolate when you want it? I love that Take 5 bar! It’s a good one. I should try to make my own! I love interval training on the treadmill. I have one of those scheduled every Tuesday next year… since I have my whole year of running planned out already. Loving that your workouts are already planned out! I used the elliptical and arc trainer when I was injured last year like 5 days a week for 6 weeks at least, and it’s safe to say I try to avoid it unless I really need it! I just honestly don’t love the gym that much, I’d rather be outside! I’d rather be on the elliptical than treadmill though. Your hair looks good! Good idea to check it out before you leave. I tend to bolt and then notice a bunch of things I don’t like. I prefer to be outside too but I do use the elliptical/gym at least once a week to keep myself from running too much and using the same muscles over and over and over. It’s not as fun but it works for me so far lol…Always check your hair before you leave the salon! I used to use the elliptical a fair amount, but I’ve given myself over to the spin bike, now that I have access to one again. 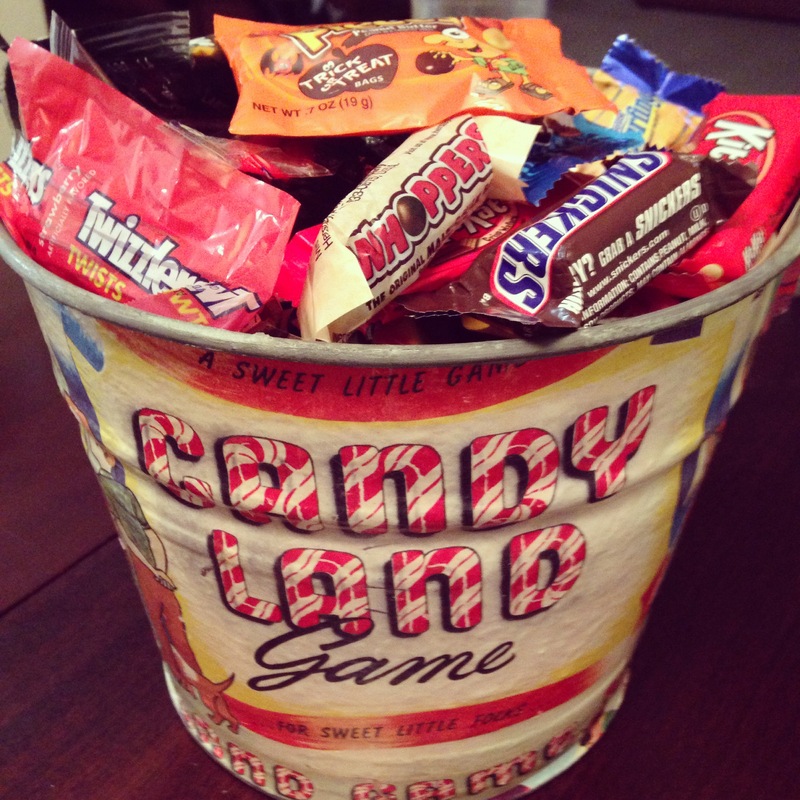 I was too perturbed by the CHRISTMAS MUSIC playing over the weekend to properly take advantage of the Halloween candy. Also we live in a high rise and have no kids. Thus. I was in Target yesterday and Christmas has overtaken the shelves already. That is really cool that you guys got yoga passes! What a fun idea to give out. I haven’t used the elliptical in..I don’t know, like 6 month? but when I get back to it I love switching it up with workouts like the one you shared! I also like pedaling backwards because I feel like it works my glutes mores. Isn’t it funny that we got Yoga passes? Such a great idea….I love pedaling backwards on the elliptical mainly because it gives me something else to do while I am on the machine, keeping me from being too bored. Okay, this is going to sound completely ridiculous but I actually had no idea you could change the incline on an elliptical! I always thought it was just the resistance + how fast you move the handles. Goes to show how much I use it! But I definitely want to start more, especially with it being the rainy season and needing some more cross-training for running. I can’t wait to test this out! 🙂 Looks awesome! 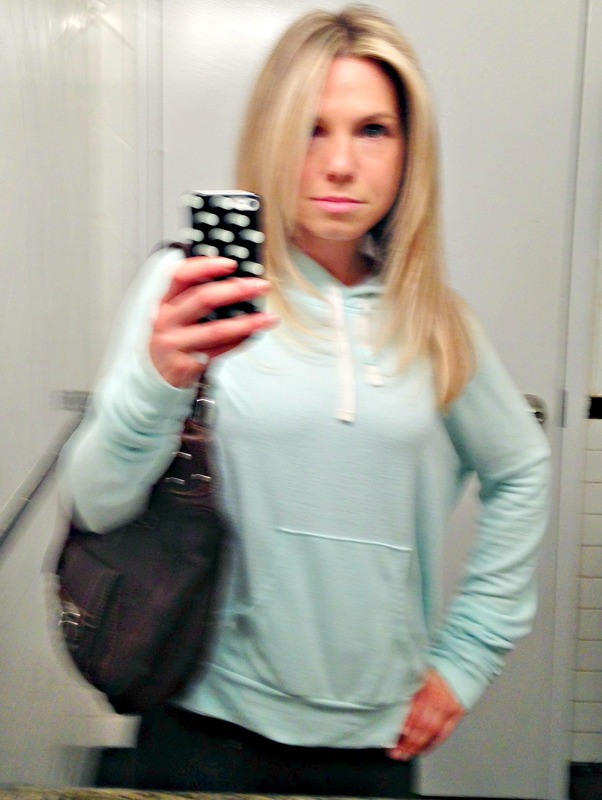 Emma @ Life’s A Runner recently posted…When It’s Time to Slow Down + Circuit Workout Roundup! It’s not ridiculous! The elliptical machines have changed so much over the years that sometimes I hop on a new one and can’t figure out if I can still adjust the inclines and resistance and have trouble determining which button does what! The ramp doesn’t incline all the way up as it used to but the random setting on the one I use does raise and lower your angle so you are still inclining up and down. I prefer to run but we can’t run every day so an elliptical workout is great for crosstraining! Let me know if you try this routine, I really like it. Amanda @ .running with spoons. recently posted…. banana bread breakfast bake . 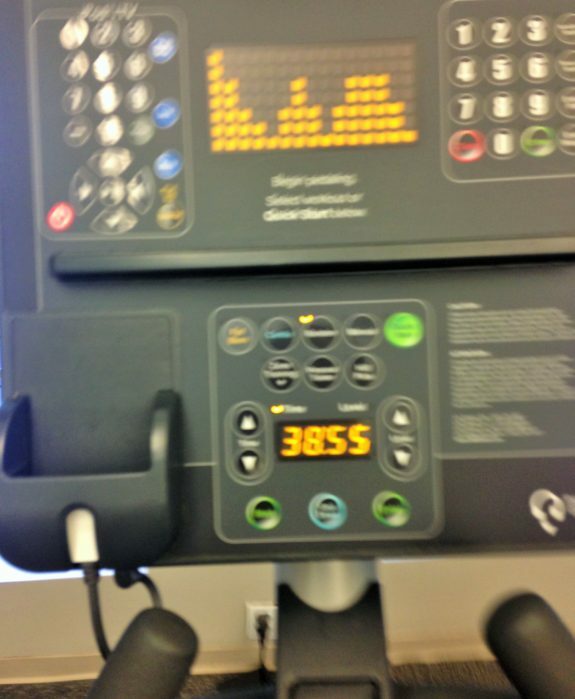 I always find the elliptical to be WAY harder than the treadmill. I am not fond of either machine, but I much prefer the treadmill. Your hair looks great! I always feel so much more put together when my hair is done. A fresh haircut and highlights always makes me feel good too. I don’t love the treadmill or the elliptical and it honestly depends on the day which I prefer! I’ve been using the elliptical a lot this year with my injury. It’s a good way to start slowly back into running after being away from it awhile. A guy said to me the other day “do you know you’re doing it backwards.” I always thought everyone knew you could go forward & backward but apparently not! Ha – I guess you taught him something new! not gonna lie.. i’m a toostie roll girl. Cheap candy! haha. and yay for ellipticals. i need this one for tomorrow, thx! I like the Tootsie Rolls too! We only got like one or two this Halloween. this has been a weekend of haircuts!!! you’re the 4th runner I know who chopped their locks this weekend! Isn’t that funny? Tis the season I guess.